If you have any questions or want to enquire about dates, use our form to contact Jennifer Forrester. Jenny and Henry’s Belgian Spitz barge was originally used for shipping grain, but they’ve transformed it single-handedly into an utterly unique home. They’ll be on hand to greet you on arrival, along with Moose, their friendly Newfoundland dog.There’s a wonderful feeling of space, and two rooms at a time are given over to guests unless you’re a group. 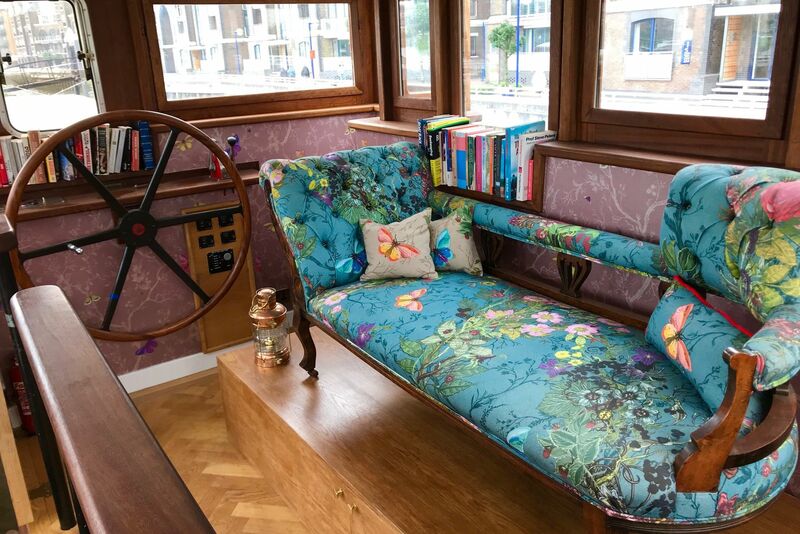 Settle in the guest sitting room by the wood-burner, hop up a ladder into a little wheelhouse library and look out onto the river from the chaise longue. Sunbathe on the two decks and lap up the to-ing and fro-ing of passing boats, herons and cormorants.Jenny loves to cook, so breakfast is a treat: good coffee, croissants, eggs Benedict or a full English – it’s a convivial affair at a long table on the upstairs level. You can take the Thames Clipper river bus into central London and there are plenty of restaurants and shops close by. We have just returned from a very enjoyable 2 night stay on Are. Lovely boat so well designed and every thing looks just right great sofas in stunning patterns . Jenny and Henry are great hosts and we enjoyed talking to them. Nothing was to much trouble and they make you so welcome. Moose the dog is great as well. We would love to return some day. You just hope on the 44 bus to Victoria from 2 min walk away. Some great places to eat in Kings Road . Thank you guys for making our anniversary special. Absolute perfection, and beyond. Unique, stylish, pristinely clean and in its own league for location within easy reach of the city, yet quiet and with views second to none. Henry, Jenny and Moose, you gave us all the warmest welcome, hearty, delicious breakfasts, help with our many bags but most of all, that rarity where the accommodation is one of the highlights of a London mini break. It was hard to say goodbye.... If a star rating is required, I give you the milky way! A piece of heaven in the heart of London! My family and I absolutely loved our stay aboard Jenny and Henry's fabulous barge. Very tasteful decor, divine breakfasts, complete peace. Waking up to the sound of geese and ducks in the heart of the city added all the more to our relaxed stay. Jenny and Henry are gracious hosts and Robin and Felicity more than looked after all our needs. Moose, their dog, was a big hit with our youngest! When in London, check out Ara - you will be hard pushed to find a boutique hotel with a difference that comes close to this beautiful home. This place is a real 'find'. We absolutely loved it and Jenny and Henry are wonderful hosts making you feel as though you are visiting friends. We had the best night's sleep we've had in a long time, amazing really considering we were in the middle of London! Built and designed to the highest standard, the Ara is fun, comfortable, full of colour and character and topped by the warmth, kindness and generosity of Jenny and Henry. I would recommend anybody to come here - the 3 of us enjoyed it thoroughly. We even sat out in the tiny garden at the back of the boat enjoying the lights on the river under a night sky. What can we say that hasn't already been said! We stayed for three nights with Jenny and Henry in December in their beautiful, cosy, welcoming home. The bed so comfortable, the breakfast with fresh produce, cooked to perfection and served in such a relaxed atmosphere that we felt as though we were staying with friends rather than the usual b&b scenario. Jenny and Henry are a lovely warm couple and we really look forward to visiting again in the summer months when we can walk the Thames Path without scarves and winter boots! Just back home after two nights on Ara which is set in a good and convenient location. Cracking accomodation, very well decorated Great bed and great breakfasts. Thanks Jenny and Henry, and my mate Moose. What a wonderful welcome to the home of Jenny and Henry and Moose. We were made to feel so special and it was a treat to be there. We enjoyed the situation on the Thames and the convenience of the Thames Clipper service to the O2. Breakfast was freshly cooked. The bed was so comfortable. What a find and far more personal than a hotel. We can`t wait to return. 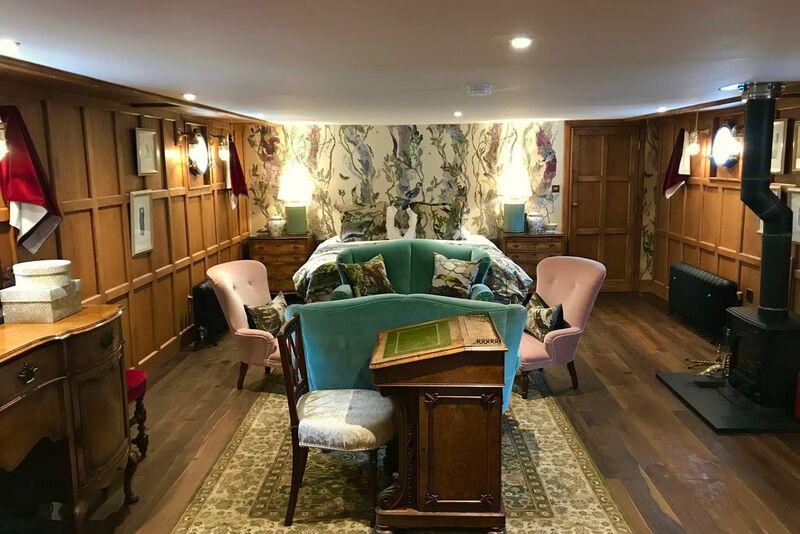 What a fabulous find and all credit to Henry and Jenny for creating this beautiful home from home on the Thames. Very convenient for the Thames Clipper jetty that is right next to the barge. Excellent value for money and a great breakfast. Thank you both (including Moose) for such a great stay. I have recommended you to friends and family. We haven't stopped talking about our stay.Why stay in a hotel when you could experience this?Right in London, the bustle of the river, helicopters in 'rush hour' only-exciting to watch.Ate delicious breakfasts at times of our choice, supervised by Moose, ably cooked by Jenny or Henry-strolled along the pier to the Clipper stop-all of London from the 'doorstep' at the tap of an Oyster card. Walked along the Thames path into Kings Road, Battersea Square cafés, nearby pubs. 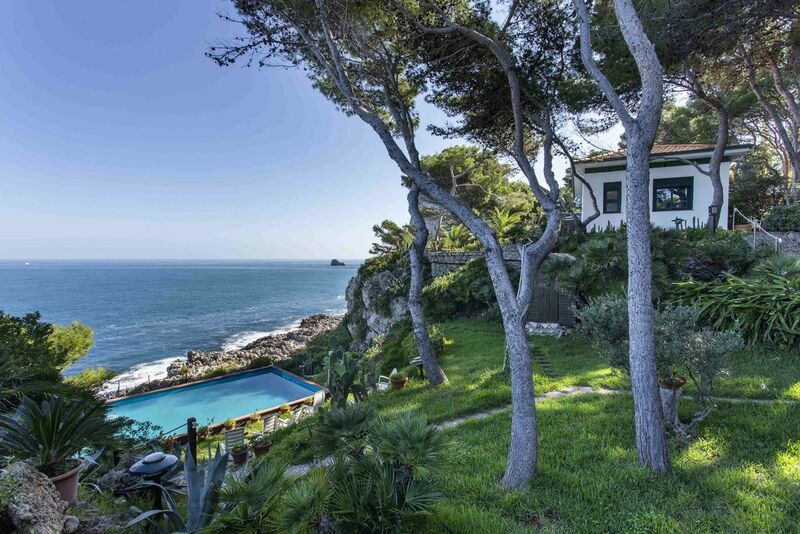 Back 'home' to luxurious bedrooms to sleep after drinking wine and watching the sunset from your own rear deck. Magical. The barge is moored on a smart pontoon on Plantation Wharf, halfway between Battersea and Wandsworth and with views of both bridges. There are good bus links and Clapham Junction rail station is a ten-minute walk away; the Thames Clipper river bus leaves from the wharf several times a day and the route into central London goes past Tate Britain, the Embankment and Greenwich. The King’s Road and Battersea Park are both a 20-minute walk. We're approximately 10 minutes walk from the fashionable part of Clapham and Clapham Junction station - with access to excellent and various bars, shops and reataurant. Being on the river, there are incredible views of the surrounding space, bridges and architecture. With the lack of road noise and limited nearby foot fall, it feels like being in the countryside whilst in London. You're right on the Thames path too! Jenny and Henry Forrester wanted to create a large, beautiful space on the river and found that this 40m-long, 6m-wide Belgian Spitz barge was the perfect blank canvas. Jenny trained as a biologist and loves animals so there’s a bit of an animal theme throughout the boat; she also loves cooking and makes wedding cakes. Henry works for a sustainability company and trained as an architect. They were professional rowers and know the river very well. 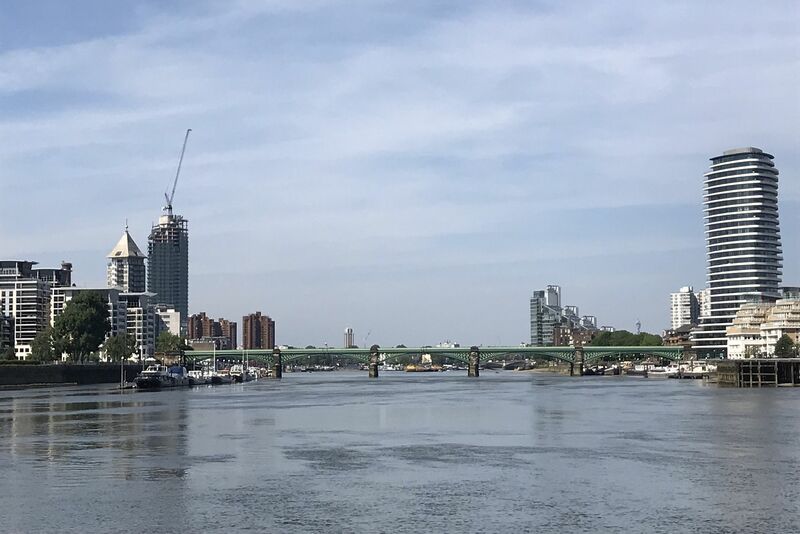 They both love having people to stay – and seeing them enjoy the boat, with its tremendous feeling of space, the river life and the birds, while still being in central London.